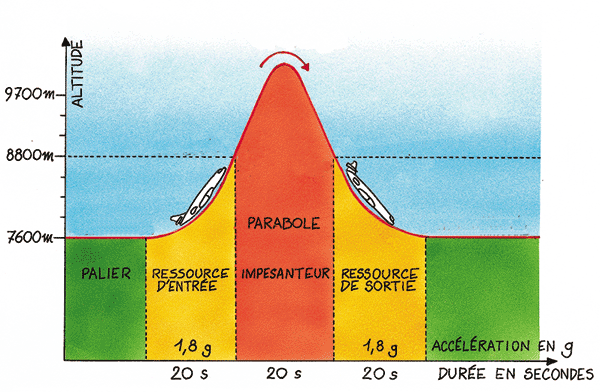 cnes | What is weightlessness? Home> How space works> What is weightlessness? It is generally thought that only space travellers can experience weightlessness. In fact, this state of apparent levitation is widely misunderstood. For example, did you know we can experience weightlessness without going into space? That just getting above the Earth’s atmosphere and then simply slamming on the brakes will not create weightless conditions? That astronauts are not motionless, but are in fact travelling at mind-boggling speed? Or that you are in a state of weightlessness when jumping off a diving board? Or that you are in a state of weightlessness when jumping off a diving board? So just what is this truly deceptive phenomenon? Weightlessness, also often called zero gravity, is in fact an ideal, theoretical state that does not exist in practice. There are always parasitic forces sustaining a residual gravity. For this reason, the environment on board a spacecraft is more often referred to as microgravity, which is of the order of one-millionth of the Earth’s gravity. Now let's get to the bottom line about gravity. Near Earth, all objects are attracted to the centre of the planet by gravity, or gravitational attraction. Any obstacle an object meets—the ground, a building or a table, for example—prevents it from falling toward the centre. It is the force the obstacle exerts on the object that creates the sensation of weight. If the object meets no obstacles, it continues indefinitely in free fall toward the centre of the Earth. As it falls, it is in a state of weightlessness. Surprising though it may seem, gravity and weightlessness are both direct consequences of the Earth's attraction. The only thing that distinguishes them is the presence of an obstacle. Figure 1 - Sitting or standing, these children have the sensation that they are being pulled downward. The floor and the chair are the obstacles preventing them from falling toward the centre of the Earth. This sensation of weight is produced by the force or reaction exerted by the floor or chair on their body. 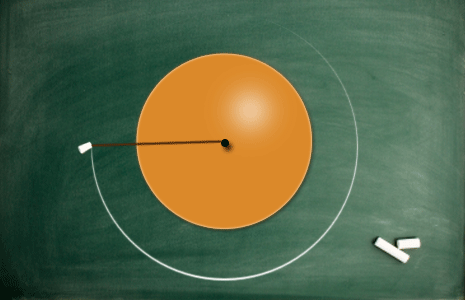 The ball, however, is seen to fall because the walls and floor are not moving. Figure 2 - Imagine that the ground opens beneath their feet. The whole room would be precipitated toward the Earth’s centre and the children and all the objects in the room would fall at the same velocity (assuming that there is nothing to break their fall). They no longer feel their own weight and therefore have the impression of floating. But they are indeed falling! In other words, they are experiencing weightlessness. In that case, what prevents astronauts from falling back to Earth? Contrary to popular belief, astronauts are subjected to the Earth’s gravitational attraction. However, they are launched into orbit at a sufficient horizontal velocity to keep them “falling” around the Earth on a closed trajectory without losing altitude. In other words, they are orbiting or gravitating about the Earth. In the 17th century, Galileo demonstrated that the velocity of bodies in free fall in a vacuum is independent of their mass. In Earth orbit, astronauts therefore always travel at the same speed, 28,000 kilometres per hour, which explains why a spacecraft and its occupants appear to be motionless relative to one another, and why they appear to be floating. Gravity is the attractive force that a star or planet (Earth, for example) exerts on a body. It lessens as the distance from the surface increases, but there is no way to suppress it artificially. Gravity acts all the time, whether we are on the ground or in weightless conditions (in free fall). Weight is a direct effect of gravity. Any celestial body with sufficient mass exerts an attractive force on the objects on its surface. However, the force exerted by gravity varies depending on where it is measured: for example, it is six times lower on the Moon than on Earth. Scales are ideal for weighing a body on Earth. We often wrongly express weight in kilograms. In fact, weighing scales measure in newtons and the graduations are calculated to give the equivalent mass, which is deduced with respect to the force of Earth's gravity (see box). Mass (M) is the quantity of matter in an object. It is expressed in kilograms (kg) and is constant wherever measured. Weight (W) is the force exerted on the mass of an object. It is expressed in newtons (N) and is the product of mass and the force of gravity (g). Thus, we can say that W = Mg. Because the force of gravity varies depending on where it is measured, so does weight. Weight, mass and gravity are in fact three separate but related notions. 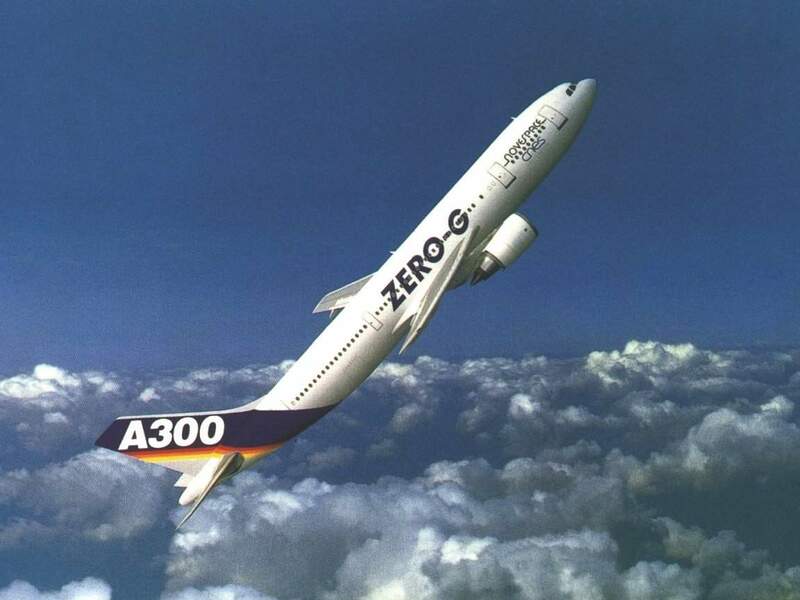 As the name suggests, an object in weightlessness has no weight, but its mass remains constant: and if the force of gravity is zero, then the weight will be zero. That is why weighing scales are of no use to us in space. On Earth, we feel as though we are very agile and free to move as we wish. But all our movements are in fact dependent on gravity. However, the absence of weight does not make things any easier in space, as any astronaut performing the same tasks we are used to performing on Earth will tell you. Water from a fountain follows the same parabolic trajectory as an object thrown into the air. If we look closer, we see that it in fact breaks up into more or less spherical droplets—much like those astronauts swallow in the weightless environment of space. 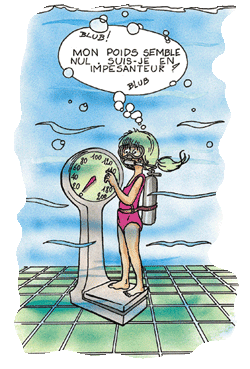 “Weightlessness is caused by a vacuum”. It is often wrongly assumed that someone’s weight is due to air pressure bearing down on their shoulders. But the weight of an object measured in a vacuum only varies by 1‰ from its weight in the open air. To prove it, consider an astronaut on the Moon: s/he is in the vacuum of space but gravity is still present, albeit weaker than on Earth. Conversely, astronauts in a space station are in weightless conditions but not in a vacuum, otherwise they would be unable to breathe. “Weightlessness is caused by the distance from Earth”. At 400 kilometres above Earth, where orbital stations like Mir or the International Space Station operate, astronauts are in weightlessness although gravitational attraction is only 10% less than on the Earth’s surface. Gravity lessens as we get further away from Earth, but we would need to travel hundreds of millions of kilometres to free ourselves from it out completely. Even though our body may seem very light and agile in water, its weight has not disappeared. Our weight is offset by the water in contact with the whole of our body, whereas normally it is only offset at the point in contact with the ground (most often our feet). The force that creates this impression of being light in the water is in fact what we call buoyancy. “Any body submerged in a fluid is acted upon by an upward, or buoyant, force equal to the weight of the fluid it displaces”. This physical law of buoyancy was discovered by the ancient Greek mathematician and inventor Archimedes (287 – 212 B.C.). According to legend, he made the discovery in his bath, whereupon he leapt out and ran into the street shouting “Eureka!” (“I have found it!” ). Archimedes was a supreme scholar who formulated many theories and is also credited with inventing the screw. While a vacuum can easily be generated on Earth, weightlessness—or microgravity to be more precise—is hard to achieve. Hard, but not impossible. Today, we have several ways of producing free-fall conditions. Drop towers several hundred metres high and drop shafts just as deep can create microgravity conditions for 3 to 10 seconds. Such facilities, which may be centimetres or metres across, are used for material physics and fundamental research experiments. Le , on a specially outfitted aircraft are another means of producing free-fall. The aircraft first ascends like a projectile using a lot of initial thrust. Under the effect of gravity, it then comes back to Earth in free fall for about 20 seconds. 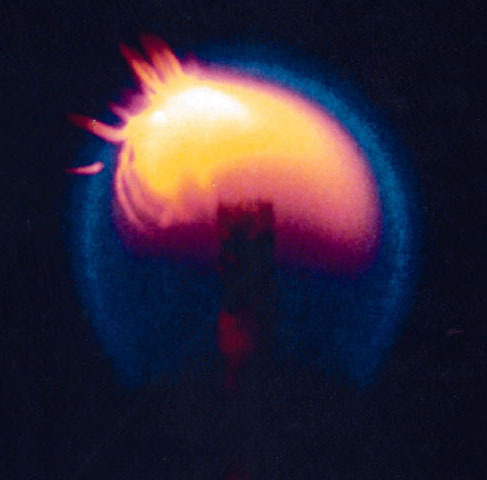 Parabolic flights are used to perform all kinds of experiments and are the only way to do it with humans. 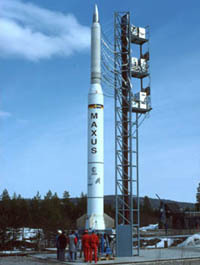 A sounding rocket works according to the same principle: it is launched vertically, after which it naturally describes a parabolic trajectory. Depending on the type of sounding rocket used, free fall conditions may last 6 to 15 minutes. Experiments are fully automatic. These techniques can only create microgravity conditions for no more than a quarter of an hour. The best way to obtain permanent weightlessness is obviously in orbit. Weightlessness is more than just a bit of fun for astronauts. 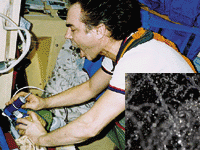 It is above all a way of creating very special laboratory conditions for scientists. By artificially suppressing the effects of gravity, we can devise completely new experiments impossible to perform on Earth. For example, solids and liquids mix in totally different ways in weightless conditions: in weightlessness, elements like water and sand form a homogeneous mixture. By solidifying them, we can manufacture materials that are hard to obtain on Earth. Gravity also affects the way we represent space in 3 dimensions. In weightlessness, we perceive time and orientation differently. Experiments in this field are designed to help us better understand the cerebral mechanisms involved and why they malfunction. Our body is designed to live in a gravity environment, the way our blood circulates being a good example. Although weightlessness does not harm astronauts’ health, we need to do more research to avoid the damaging consequences it could have on long trips in space. 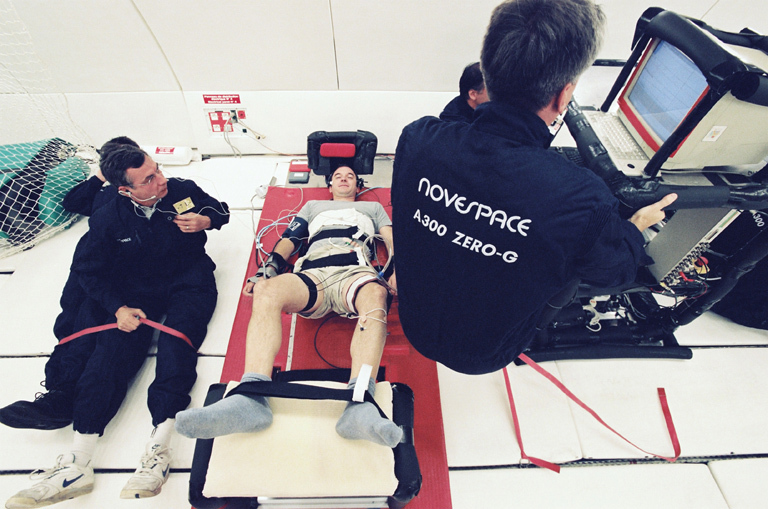 For this reason, weightlessness provides the ideal experimental conditions.